It's been 53 years since the original Mary Poppins popped onto our screens with her magical bag and flying umbrella. She's back in December 2018 – played by Emily Blunt – to visit the grown-up Banks children, in 1935, in the Disney musical sequel Mary Poppins Returns, where London is once again a star of the story. 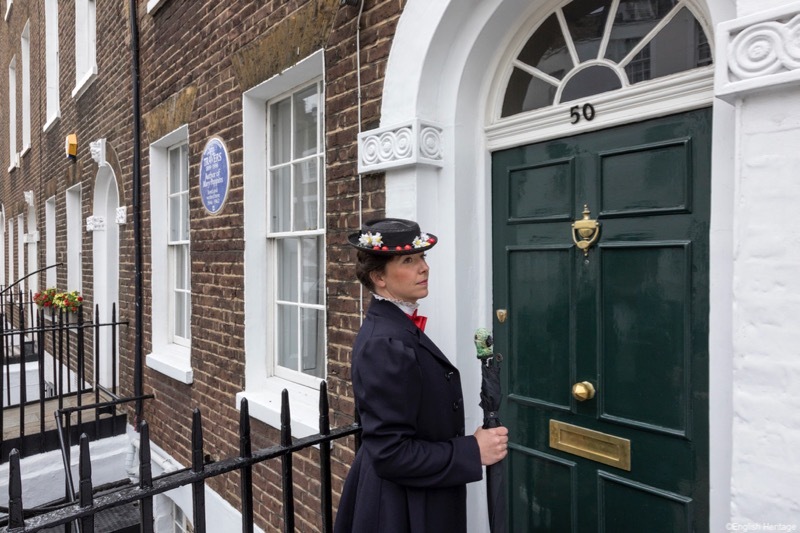 Here’s how to have your very own magical Mary Poppins experience in the capital that’s, as our favourite nanny would say, practically perfect in every way. Discover behind-the-scenes stories from the new film and details from the original Mary Poppins books and film on the new Brit Movies Mary Poppins tour, launching in 2019, which will take you through the streets of London and the locations used in Mary Poppins Returns. The two-hour walking tour, which is family friendly, will take in famous landmarks that you’ll recognise from the original movie and that have appeared in the sequel’s trailer, such as St Paul’s Cathedral, one of the most impressive examples of cathedral architecture in the country. Another filming location was by Buckingham Palace – its state rooms are open to visitors for ten weeks each summer – as was outside the Bank of England. While this isn’t open to tours, you can visit the Bank of England Museum. We wouldn’t have the films if it wasn’t for the original books created by Australian-born author P.L. Travers who spent most of her life in England, which was where she created her unforgettable character. She wrote a series of eight books on the magical nanny at 50 Smith Street in Chelsea, which earlier this year was commemorated with an English Heritage Blue Plaque. P.L. Travers lived here for 17 years and the house is said to have inspired the look of the Banks’ family home in the original movie. You’ll get more than just one spoonful of sugary treats at this creative and delicious afternoon tea at Aqua Shard. Launched to coincide with the relaunch of the five original Mary Poppins classic books, this afternoon tea of nostalgic sweets and savouries is available until April 2019. The menu is a gilt gold framed mirror menu – the mirror is a recurring symbol throughout the books – and tea is delivered on a custom-made tea stand with an umbrella on top and silver booted feet below – with crockery designed with Mary Shepard’s original illustrations of Mary Poppins. Feast on homemade scones with jam and clotted cream (which you’ll find in Mary’s carpet bag); miniature crumpets; two bespoke teas ‘Mary’s Tea’ and ‘Bert’s Tea’; unique sweet treats such as Mary Poppins’ very own hat with a black ‘Cherry Tree Lane’ mousse covered in dark chocolate, and Fairground Candy Floss. Order champagne with the tea and be charmed by the kite that flies from the champagne flute before adding ‘medicine’ to the glass, with the choice of three homemade liqueurs. It’s all veyr supercalifragilisticexpialidocious! The trailer from Mary Poppins Returns includes a spot of kite-flying – which will have you humming Let’s Go Fly A Kite! from the original movie in no time. You can fly a kite across many of London’s green spaces, but if you want to fly your kite against the backdrop of the celebrated London skyline, head up to the top of Parliament Hill in Hampstead Heath, north London. Primrose Hill near Regent’s Park also affords spectacular views over the capital; the top of this hill is one of six protected viewpoints in London. Bert took Mary Poppins up to the rooftops of London to show her the view of the capital through the eyes of a chimney sweep but you can gaze over the capital’s magnificent skyline in a far more sophisticated manner. London has many rooftop bars with panoramic vistas over the capital’s rooftops. Try out the Rumpus Room on floor 12 of South Bank’s Mondrian Hotel for its awesome view of St Paul’s Cathedral; the Radio Rooftop Bar at ME London for 360 degree views of the capital; or The Rooftop St James’ overlooking Trafalgar Square and ideal for all weathers thanks to its retractable roof. What is Mary Poppins’ favourite mode of transport? Flying in by umbrella of course! While owning a flying umbrella is just a dream, you can have your own bespoke brolly created at one of London’s historic establishments of fine craftsmanship. James Smith and Sons, just off Regent Street, has been designing and making high-end umbrellas (think handles of exquisitely carved wood) since 1830, while Fox Umbrellas has been creating beautiful bespoke umbrellas since 1868. Once you’ve watched the sequel, you may want more things Mary Poppins and you see can her again on the stage when she returns to the West End at Prince Edward Theatre in Autumn 2019. Booking for the show opens in January 2019. A City of London landmark since 1925, the building now occupied by luxury hotel The Ned was once the headquarters of Britain’s Midland Bank, a striking building designed by Sir Edwin Lutyens – one of Britain’s greatest architects – that was the largest clearing house bank in the world at the time it was built. Now a five-star hotel, part of the Soho House & Co Group and Sydell Group, its banking legacy means you’ll stay in a super-stylish building dominated with high-vaulted ceilings and grand doors. Its rooms range from the cosy ‘Crash Pad’ to Grand Heritage suites on the Grade I-listed fifth floor. Eight restaurants, ranging in cuisine from Italian to British, American to French, sit within the former banking hall, each with its own space separated by 92 verdite columns and walnut banking counters. This pub and restaurant’s name sums up its past; it sits in the former Law Courts branch of the Bank of England, on the historic Fleet Street in the City of London. Stunningly renovated, the Old Bank of England has updated the ornate interior of the venue where the Bank of England traded from 1888 until 1975. When you’re enjoying your hearty British meals (think hand-made pies and fish and chips) you’ll be doing so surrounded by history; the basement still contains the original vaults used to store bullion and some of the Crown Jewels during the First World War. The two safes are now the venue’s cellars and kitchens. Situated on Piccadilly, The Wolseley is run in the style of the European Grand Café, serving everything from breakfast to lunch, afternoon teas to dinners. As well as the food, people come for the prestigious surroundings of the building that started life as a car showroom – Wolseley Motors – in 1921 and became a branch of Barclays Bank in 1927. Architect William Curtis Green created an opulent building, with marble pillars and archways, later adding banking counter and managers offices, which now serve as the bar and tea salon. When it became The Wolseley many aspects of the original design, including the domed ceiling and marble flooring, were kept. The Bank of England is not open to visitors but you can explore its fascinating museum in the City of London. Five different galleries will take you through economic history and that of the Bank of England, from the origins of paper money and examples of forged notes to explaining why modern banknotes are difficult to counterfeit.